We were sorry to be leaving Mull, but with several days of poor weather forecast and a looming deadline to get to Aaron’s graduation we just couldn’t hang around and wait for things to improve. Our plans to spend a few days on the Ardnamurchan peninsular were also in jeopardy. We still took the ferry over to Kilchoan but now we were just going to drive through rather than stopping over. Even though our plans are not set in stone there is a feeling of disappointment when we can’t do something that we had talked about and looked forward to. We know we need to let go and make the most of what we can do rather than dwelling on missed opportunities, Paul’s much better at taking it in his stride than I am. We got on the ferry around midday after a quick grocery shop, the tide was pretty low so we needed to get some help to avoid grounding at both ends of the journey. Luckily the staff at Calmac are used to helping motorhomes on and off their services. Maybe too used to it – there are some people who think that there are too many motorhomes travelling on Scotland’s ferries and putting pressure on Scotland’s roads. The press have reported that the number of motorhomes using some services in 2016 is more than ten times the numbers recorded in 2008. It’s difficult to tell whether this is significantly higher increase than other vehicles without seeing the full statistics, but anecdotally there has been a significant increase in motorhome ownership and hire. It’s even been debated in the Scottish Parliament; should an additional tax be levied on motorhomes to help support the infrastructure required? It will be interesting to see the outcome. Once safely off the ferry we were driving through the Ardnamurchan peninsular, this area feels more remote than that islands we have visited and we are looking forward to tackling it on a future visit. As we drove through we marvelled at the vibrant colours that framed the roads, autumn was really starting to show with the russets and golds of the trees, the dull blonde of the autumnal grasses and even the seaweed on the rocky shore contributing to the auburn hues. 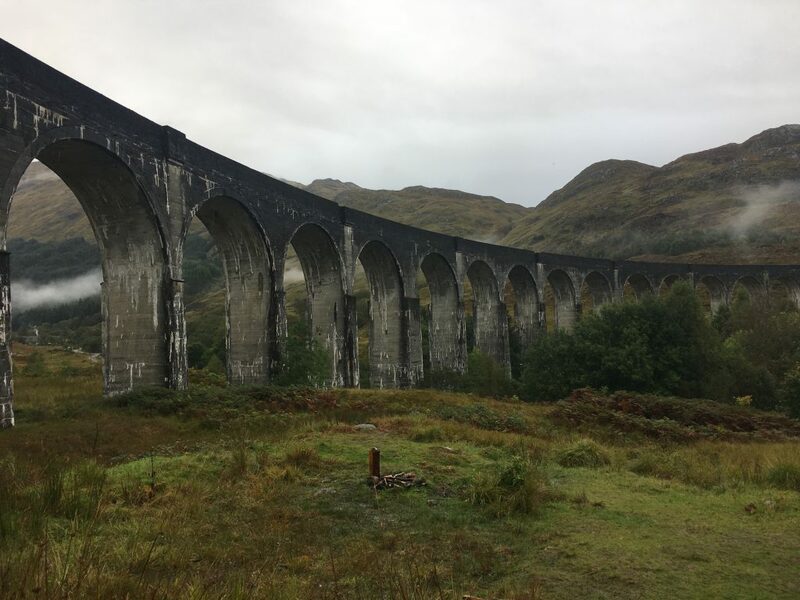 We ended up driving as far as Glenfinnian that evening, this is the location of the viaduct that carries the West Highland Railway and has featured on TV and film. Most recently (as far as I know) it was used in the Harry Potter film when they depict the train on it’s way to Hogwarts. We parked near the viaduct but didn’t go to see it that evening as it was too wet. Instead I popped up the following morning to take a look. Sadly there were no trains running at the time, but even so it’s an impressive structure.